I spend so much of my day, sending and responding to emails in work and replying to comments on my blog. But, even though I’m communicating with people, I feel like I don't really know them. Emails don't convey personailty or idividuality and it's hard to say what you really feel in an email. I really enjoyed sending my post card to Alice and receiving a lovely hand crafted letter from her so I’ve decided I want to set up a pen pan exchange for bloggers. I want to return to the long-lost days of letter writing, penpals and handwritten thank-you notes. There’s something so special waiting for the post man to arrive and seeing a letter in there amongst the bills and junk mail. Who wants to join me in bringing back snail mail?! 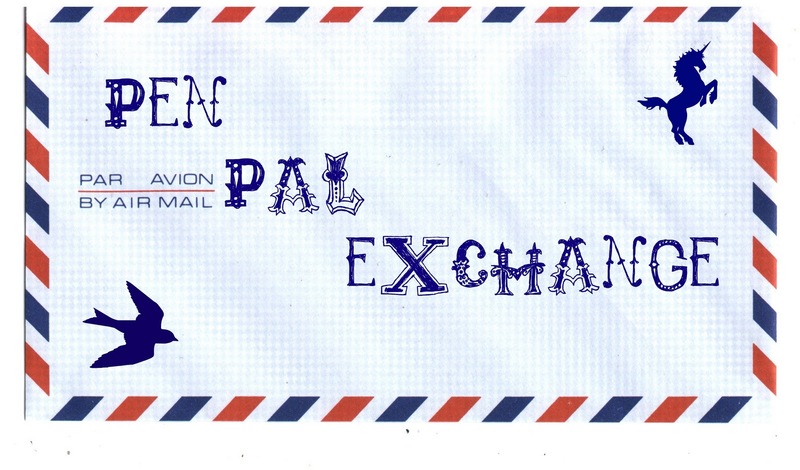 It would be great if you could tell your blogging friends about it or tweet about the Pen Pal Exchange, the more people that take part the more fun it will be! I have a stamp set itching to be used. I'd love to take part in this! I am in! I haven't had a pen pal since I was a kid! Great blog...the name is super cute and that header image is a hoot..love it! Great post...very unique idea...well done! Come and check out my blog...I know you will love it...I have an article up right now you'll be really interested in I think! So happy lots of people want to join in! I'd love to be involved! ohh count me in, im obsessed with post and all things snail-mail!! I used to love writing letters! I would like to be included please! I would love to take part! 29 now girls! :) can't wait to get started! i'd absolutely love to get involved! letter writing is something i'm constantly nagging my mr to get more up on, seeing as he lives in Southampton and i live in Cambridge! Ooh yes please - what a brilliant idea, I love receiving post! My email is rosietapping@hotmail.com. I would luuurve to get involved! I'm quite a recent follower, but I'd love to take part too! Sounds like a great idea. I'd love to join in if that's ok. Thanks for joining up everyone :) tell your friends about it, the more people that join in the more fun it will be! I'd love to be a part of this as well! I loved having pen pals at school, count me in! you have a fabulous blog. sounds like such a great idea! I love this idea, count me in as well. My email address is illivonray@gmail.com. im so up for this! I literally was only just moaning to a family member that no one writes nice letters anymore and the only post I seem to receive are bills and junk mail! Happy to have you on board Donna! This sounds fantastic! I'd love to join in! What a brilliant concept. I absolutely love it. I had actually just written a post about the very same thing last week so I would love to get involved in this - I love writing letters! i would love to be apart of this!!! brilliant post, i will do it! Sounds like loads of fun, count me in! Sounds ace! Count me in.. I love this idea ! I'm in! I hope I'm not too late I'd love to do this! Hope I'm not late in here!! Please count me in! I totally love pen friends, in fact this is absolutely a great idea!!! I'll probably publish a post like this cuz it's a wonderful idea!!! I'm a day late! If you can squeeze me in, my email is janelleqt@gmail.com. Great idea!